RedVector is happy to announce the launch of two brand new mobile-ready eLearning courses for land surveyors. Both courses were written and presented by Patrick C. Garner. Pat is a hydrologist, professional wetland scientist, and a professional land surveyor. He has served as President of the Massachusetts Association of Wetland Scientists, teaches wetland and river workshops, and has published numerous articles on wetland science and ethics. He is a principal of Patrick C. Garner Company, Inc., in Northborough, Massachusetts. 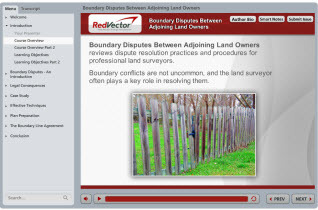 This RedVector course focuses on boundary disputes between adjoining land owners. Such conflicts are not uncommon, and the land surveyor often plays a key role in resolving them. This course examines protocols for the professional to follow when encountering disputes between abutters. By the end of this course, students will be able to conduct thorough deed research for all affected properties, document findings and field work, demystify technical procedures, and think like a detective. 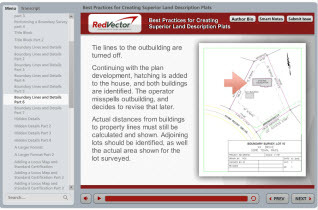 This RedVector course defines Best Practices for Creating Superior Land Description Plats. It describes the intent and purpose of any plat and briefly reviews historic practices, basic mapping requirements and minimal data required to record a plat throughout North America. Recommendations will guide a surveyor step by step through the creation of exceptional maps and will include a checklist of essential elements that exceed the usual state-required minimum mapping requirements. This course will show you how to decrease your own liability as well as aid surveyors in the future. By the end of this course, students will be able to explain the purpose of a plat and a plat’s importance, name the basic minimum data required of a plat, recognize the importance of exceeding minimum regulatory plat requirements, and label the elements of a superior plat. RedVector is excited about the launch of these mobile-ready courses and has several other new courses coming soon. Be sure to follow our blog and check us out on Facebook and Twitter to stay up-to-speed on all the latest eLearning news and course launches! For more information about this or other RedVector courses, contact our client support department today.